The day has finally arrived. The culmination of a year and a half's worth of work. 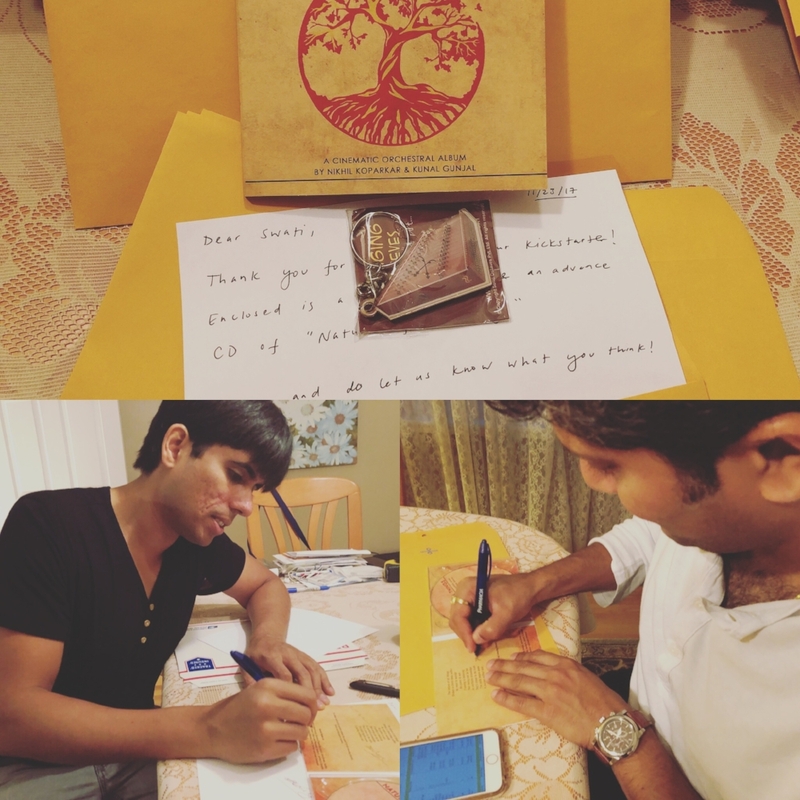 Recording sessions for the piano and santoor in LA, recording sessions for strings in NYC, recording the percussion back in LA, a Kickstarter campaign, mix and master -- and you've been with us through the whole journey. And for that, THANK YOU. You have no idea how much it means to us to have you in our corner, and we can't wait to share this music with you! You should have already received your DIGITAL DOWNLOAD link last week. If not, please message us and we will get you set up. We will be autographing and shipping these very soon, so check your mailboxes! PERCUSSION RECORDED + MIX/MASTER IN PROGRESS! It's been a while since we've updated you, and a crazy last month or so getting everything together for mix and master. We are extremely fortunate to have the talents of David Myers Jr to play a host of World Music percussion on our album, recorded at a studio in Agoura Hills (the same place we recorded our piano and santoor tracks). David experimented with tablas, bass drums, rain sticks, and other instruments non-traditional to the Western orchestra. We had SO much fun experimenting with these sounds! Nikhil spent the last couple of weeks getting the sessions ready, including editing all the audio to send to John Rodd for mix and master. Now that that's all out of the way, we play the waiting game! BUT the good news is we are still on track for delivering the album to all you backers on time! Now that we are back from our string recording session, we have immediately started work on the percussion elements. We have just about enough left in our budget to hire live musicians for the percussion elements, and so we met in the Bay Area this past weekend to discuss in detail how to record and create the sonic textures necessary to put the finishing touches on the music! Here is a behind-the-scenes look at our upcoming finale track, "ASCENT", upcoming plans with the album, as well as how we combined Indian Raga's with western orchestral music. Hope you enjoy, and looking forward to sharing the new music very soon! We flew to NYC on May 22nd, and prepped orchestrations the following day for a mammoth 12 hour recording session on May 24th at Spin Recording Studios in Long Island City, NY. In that one day, these fantastic musicians took our scores, our ideas, and brought them to life!! Dave knew just what to add to our orchestrations to make certain melodies pop, and they were often getting the music done in just a couple of takes! These tracks were ambitiously written, and we couldn't be more pleased with the result!! The rest of the trip was a whirlwind of sightseeing, and networking with other amazing musicians. We can't wait to show you all pics and videos! Next steps are to edit all the string parts, add percussion, any other horns/woodwinds, and send to John Rodd for mix/master -- all in the next couple of weeks! Thanks to all of you for helping us realize our vision -- we are FULLY FUNDED! We will continue posting updates to all you wonderful contributors here as we keep moving forward with our album, "Nature Of All Things"! We are so excited to work with the talented Dave Eggar along with a string quintet in NYC on May 24th -- we have been hard at work the last few months on orchestrating for strings to capture the sound we are looking for. Nikhil has previously written orchestral music for films and video games, and is using his experience in arranging the strings to complement the piano & santoor. This is no easy task, as this is the first time these instruments are being used together in this way! Every arrangement is a chance to do something new and different, and that in itself is very exciting for us!! Here is a bit of sheet music from our title track. Keep a lookout on natureofallthings.com for more updates as well! We will be sending out surveys to start getting rewards scheduled to you guys shortly! THANK YOU! FULLY FUNDED ON KICKSTARTER! WOW! Thanks to you all for your generous contributions to our Kickstarter campaign -- we are now fully funded in only 6 DAYS thanks to your help! We have received 40% over our initial funding goal, and will use the extra money towards live percussion and other orchestral elements. It's important to us (as I'm sure to you) that every dollar goes towards making this music the best it can possibly be! String recording session in NYC on May 24th! We will be flying there a couple of days before, and will be recording with the talented cellist Dave Eggar and his team, for a string quintet on the album! We are so excited to show you the new music, and will continue to update you guys soon! Here is santoor artist of "Nature of All Things", Kunal Gunjal warming up before our recording session for the upcoming track, "Morning." He blends traditional Indian Folk melodies with Nikhil's western piano for a unique fusion of the two.